I have a new book to mention today, and I’ll probably be referencing it frequently. I had seen Stir: Mixing it Up in the Italian Tradition included on several best of 2009 lists, and I snapped it up as an impulse buy. I’m glad I did. The chef/author Barbara Lynch operates multiple eateries, a catering company, and a full service butcher shop in Boston which gives me more reasons to visit that city again one of these days. As the title implies, the dishes in the book are Italian-inspired, but here and there, you will find some French influence as well. For instance, it won’t be long before I try her brioche pizza, brioche!, with fried pistachios and honey or the one with black olive paste and fresh ricotta. She includes a recipe for fresh ricotta as well. Several of the salads are tempting me right now like the harvest salad with a variety of root vegetables and the fennel, cucumber, and green bean salad with roasted potatoes and creamy yogurt, but I had to try the bibb lettuce with creamy parmesan dressing and cheese crisps first. There are also chapters devoted to soups, seafood, fowl, meats, side dishes, and sweet treats, but the chapter I zeroed in on immediately was pasta. It won’t be long before I post about the orecchiette with cauliflower or the roasted corn and tomato lasagnettes, but for today, we have the spaghetti with spicy clam sauce. For several of the pasta dishes in this book, Lynch recommends freshly made pasta, and this was one of them. Her fresh pasta dough recipe is a rich one with two whole eggs and four egg yolks, but the dough was a thing of beauty that was easily worked. My hand-cranked pasta machine only has cutters for fettuccine or spaghetti widths, so although linguine width was suggested here, I went with spaghetti. The sauce was started by steaming littleneck clams in white wine, and then removing them from the pot to let them cool a bit. The clams were removed from the shell, they were chopped, and the steaming liquid was strained. I kept a few clams in their shells as garnish. Olive oil was heated in a skillet, and the chopped clams and some minced garlic were added and cooked for a few minutes. Red pepper flakes were added to taste, and for me that meant a lot of red pepper flakes. The fresh pasta was boiled, drained, and transferred to the skillet with the clam sauce. For serving, the tossed pasta with sauce was drizzled with olive oil and a little lemon juice, and caution was thrown to the wind as grated parmigiano reggiano was suggested as a topping. Kurt, as usual, allowed no cheese near his shellfish, but I gladly sprinkled it over my plate. We started our meal with the bibb lettuce salad with creamy parmesan dressing, and loved the thick, rich dressing over crisp, fresh leaves. 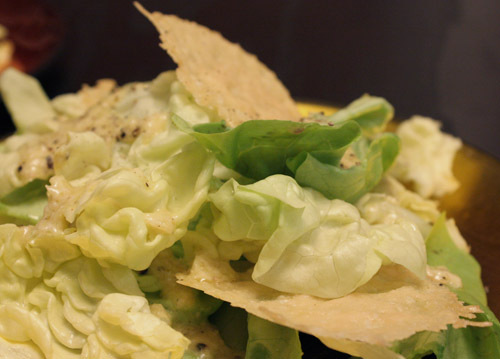 The parmesan frico crisps brought nice texture and extra flavor to the salad too. Then, we moved on to the pasta, and fresh pasta is always kind of special and noticeably tasty, so of course it was delicious. However, remember those four egg yolks in addition to the two whole eggs in the pasta dough? They made this is a very enjoyable pasta, and the clams were fresh and feisty with the crushed red pepper. Whether you opt for the grated parmigiano topping or not, you’ll have a very good meal with this. Now, I have to flip through the book again and decide what I’ll be making next. Lisa, this is exquisite...I love spicy, adore seafood (clams) and delight in fresh made pasta. I think this might be equally as yummy with mussels, huh? I have mussels I need to use, so I rationalize. So sue me. LOL! Nothing beats homemade pasta! Your spaghetti looks yum! Do you know I've never eaten clams? This makes me want to. 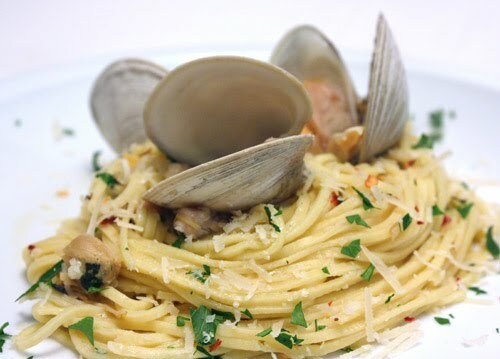 The spicy clam sauce sounds fantastic with spaghetti! What a great meal! Oh homemade pasta just sounds amazing with this sauce. I am so impressed,Lisa. Homemade pasta with that wonderful clam sauce! And a gorgeous salad with parmesan crisps! I am anxiously awaiting your brioche pizza! first of all, i continue to be impressed with anyone making homemade pasta--bravo. secondly, what a pile of amazing dishes you've named here! and the focus of this post is no exception--it sounds just downright heavenly. what a find! Your pasta and clams look delicious... I was standing and looking at the calms today - now I regret not buying any; I could've made your spaghetti! PS; Of course, I would've had it without your home made spaghetti...! O you made your own pasta!! I am still planning on doing that at some point in the near future. I am not a big fan of clams... I just can't stand the little popping sounds they make before you bake the poor little creatures... I know I am a softie at heart...lol... Looks delicious though! Everything looks wonderful. Homemade pasta, fresh clams, parmesan crisps...can't get any better. Wow, Lisa. This is my dad's FAVORITE pasta dish! But with fresh-made pasta? Wonderful! Delicious sea food pasta, especially if it has that a bit of spicy bite to it. 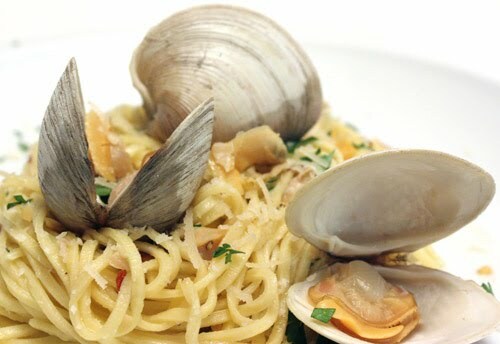 LOVE spaghetti with fresh clams and clam sauce! Yours is simply gorgeous! And spicy? Yes! This looks like the perfect meal, and I agree there is just something about homemmade pasta to make it special. Of course its fun to make too! seafood and pasta are always a hit with my family.I'm sure they are going to love this! Yum! The last time I cooked w/clams I did not realize I had to de-beard them: I was so grossed out, I threw them all away! You remind me I should make some fresh pasta. Clam pasta is one of my all-time favorite dishes. I can never get enough of it, or of trying different renditions of it. This pasta dough sounds amazing -- I can't believe all the eggs in it. This is for a pound of pasta? I bet it had a wonderful velvety texture. Mmm, that looks fantastic! I especially love that you used fresh pasta. It's so worth the extra effort. Yum! Sounds like such a great book! 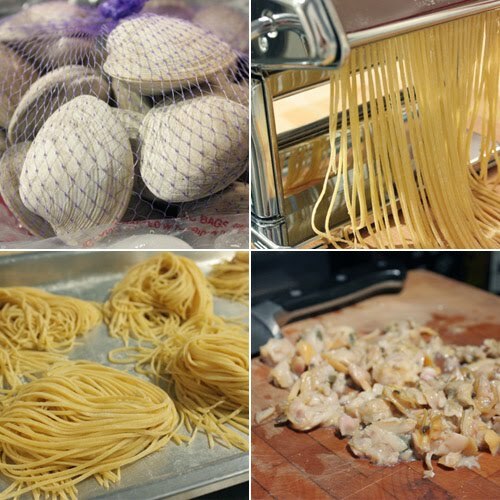 I really want to make homemade pasta this year - all those extra yolks make it sound so good!